Looking for things to do in the Gold Coast? 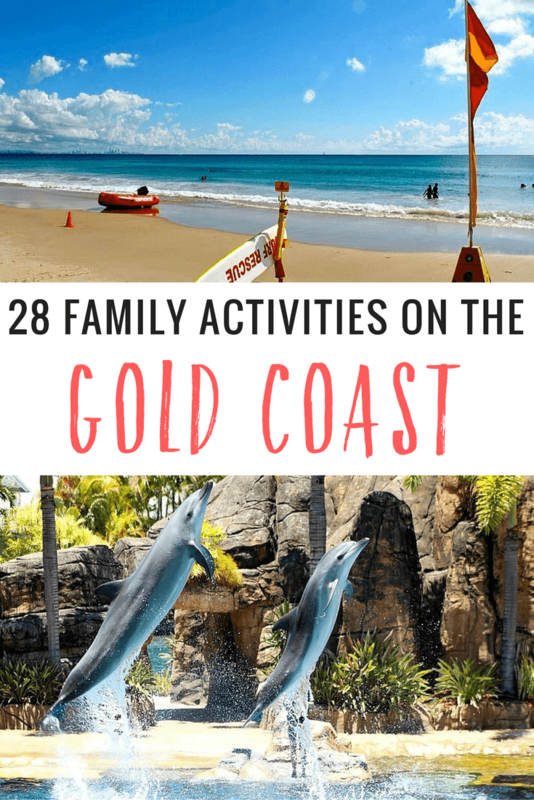 After having visited the Gold Coast as a child many times, and now as a parent taking my own kids, you don’t have to look too far for activities, adrenalin, and adventure. That’s the Gold Coast tag line! Hard to argue really. With more than 300 days of sunshine, 70 kilometres of coastline, and the Southern Hemisphere’s largest range of attractions and activities, it’s no wonder it is high on the family travel bucket list. The Gold Coast has things to see and do to satisfy all kids (and parents) of all tastes, year round. 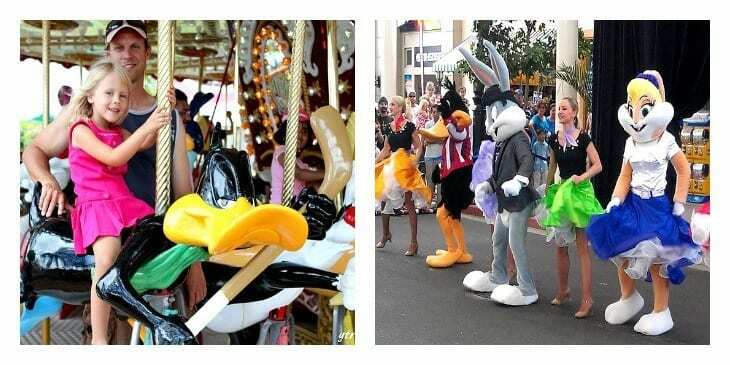 Love theme parks? Done! Love pristine beaches? Plenty! Love the hinterland? It’s there! Love exercise? Start stretching! Love sunshine? Got that too! But be careful, the Gold Coast has a playfulness energy that will have your kids ( and you) begging to go back for more! Kalyra also learned how to surf at Burleigh Beach with a world surf champion as her teacher. 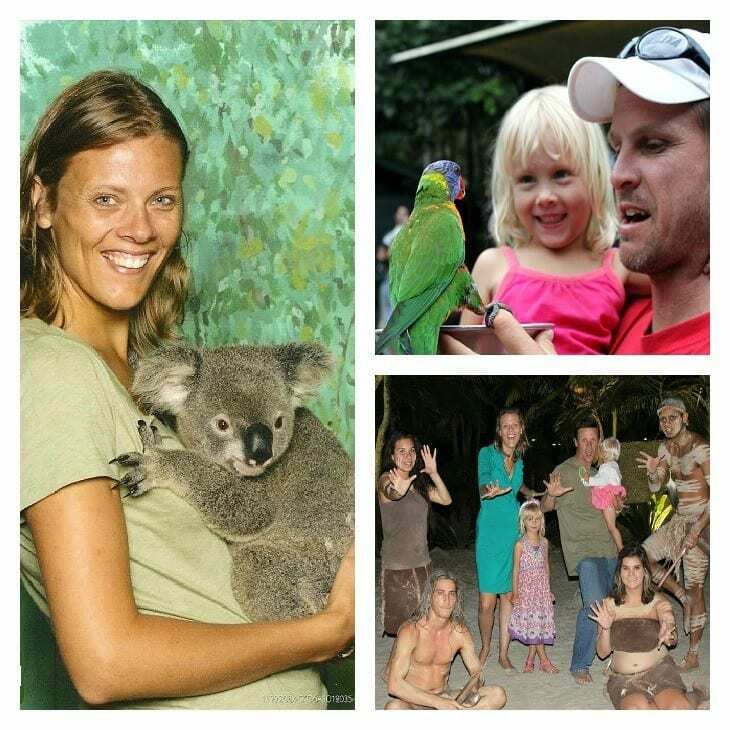 Take the extreme high ropes green challenge, cuddle a koala, feed the kangaroos, and meet so many other Australian animals at the Currumbin Wildlife Sanctuary. 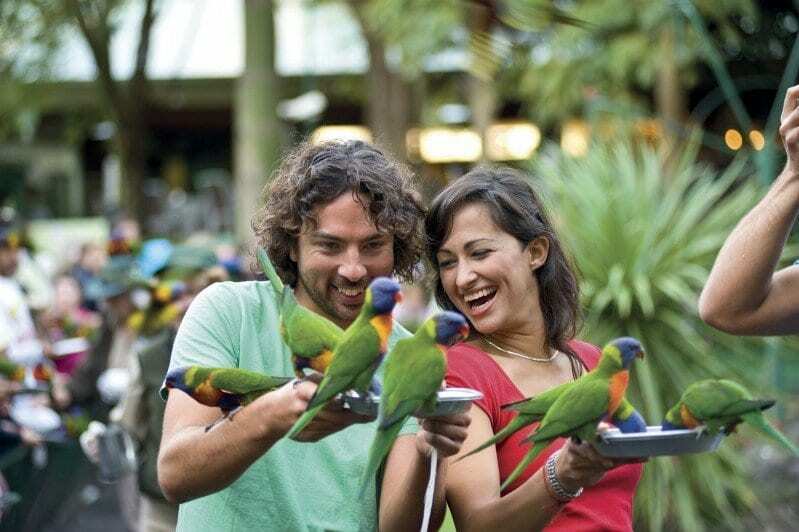 Don’t forget the free lorikeet feeding every day at 8 am and 4 pm out the front. A must is the evening Yanguwah Aboriginal cultural show. Tickets to the Sanctuary can be pre-purchased here. 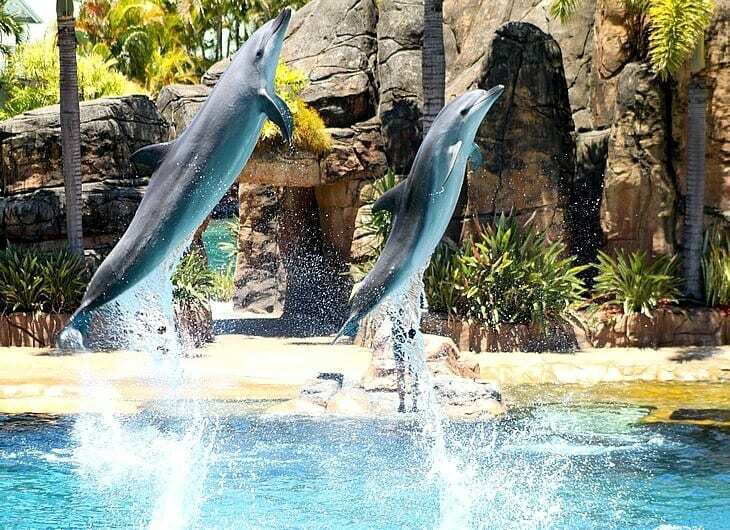 Watch the world’s best stunt performer’s mastering aerial flips and gravity defying stunts in the Jet Ski Show, watch the dolphin’s doing the same in the Imagine Dolphin Show at Sea World. OR, even stay at Sea World Resort and have your private Dolphin Discovery presentation. It’s a great Gold Coast attraction for kids. Watch Australian stockmen and women bring the legend of Phar Lap to life. The Australian Outback Show includes a themed dinner. It’s a unique thing to do in the Gold Coast for families. Get your Outback Spectacular tickets here. Visit Moreton Island for activities such as dolphin feeding, tobogganing, quad bikes, archery, tennis, badminton, snorkeling, kayaking, shipwrecks, eco walks and parasailing. It’s one of our favourite things to do in the Gold Coast and is a definite must if looking for a Brisbane getaway. 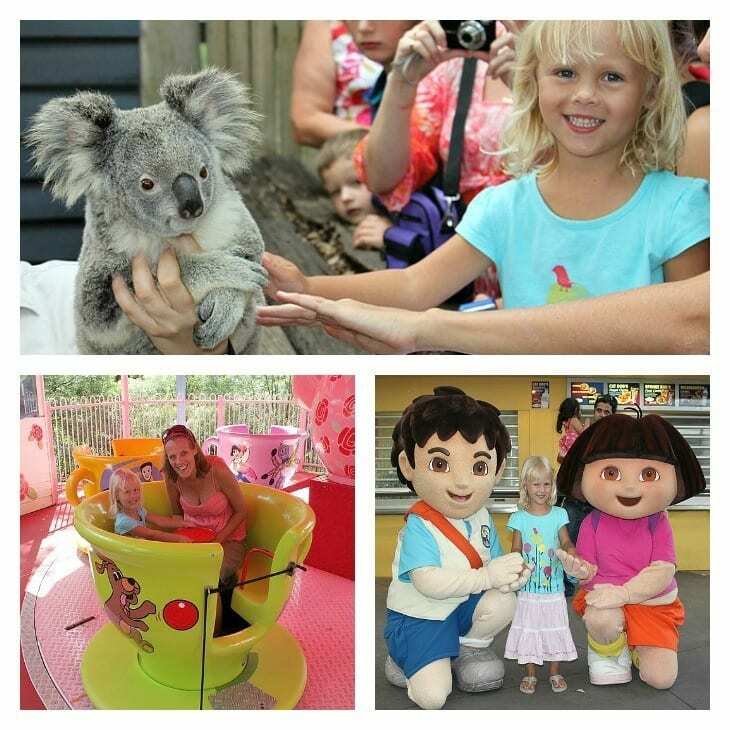 Dreamworld is one of the most popular things to do in the Gold Coast for families. High action adrenalin seekers can conquer Buzzsaw, the new bone chilling ride. Try your hand at the 6 other thrill rides or for the younger ones head straight to Wiggles World for some dancing with Dorothy. Read about our experience at Dreamworld. Head straight for the ultimate water park on those hot summer Gold Coast days. Have a relaxing swim in the wave pool or scare yourself on the skycoaster. This is the thing to do for families on those hot Gold Coast days. Strap yourself in with the guys from Jet Boat Extreme! Australia’s largest Museum of its kind, featuring more than 110 life-size wax effigies. Meet Presidents and former Prime Ministers, Entertainers, members of the Royal Family, Dictators, and many others. The figures have been crafted by leading overseas sculptors, equal in quality to the world’s best. Where adventure meets nature on over 112 hectares on Tamborine Mountain. Fossick for treasures in the world’s largest mine of thunder eggs. Let the kids have fun rolling on the water sealed inside giant a plastic bubble at Pacific Fair Broadbeach while you go on a shopping spree! Fly through the world heritage listed Lamington National Park on the Binna Burra Mountain Lodge flying fox. Get some action on two-hour guided tours of the Gold Coast Hinterland in Numinbah Valley through rivers and creeks and climb to new heights to experience some of the best views the Gold Coast. 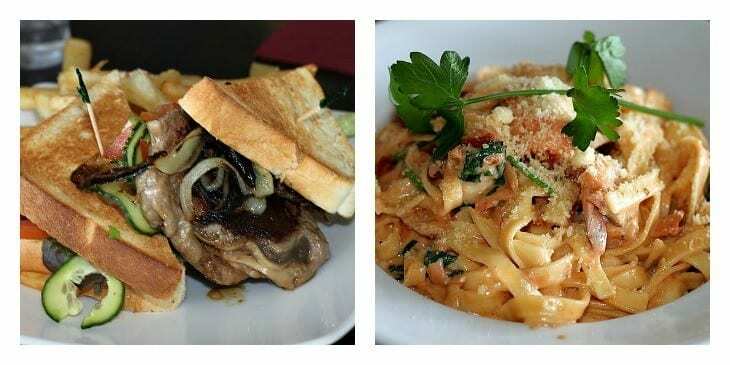 Have breakfast, lunch, or dinner at one of the Gold Coast’s family friendly Surf Life Saving Clubs. Freak yourself out on a mind-bending journey through labyrinths of spooky passages, a museum of weird collectibles, dare doors, leaping monsters and state-of-the-art special FX. It’s Dracula’s new venture the AUD6.5 million dollar haunted “Walk-through” attraction. Get back to nature with these 4 Gold Coast walks. Designed for family fun and fitness! Takes elements of SAS commando training delivered as safe, fun and exciting. 85 challenges over five courses combining rope and wire challenges, flying foxes, suspended bridges, and much much more. 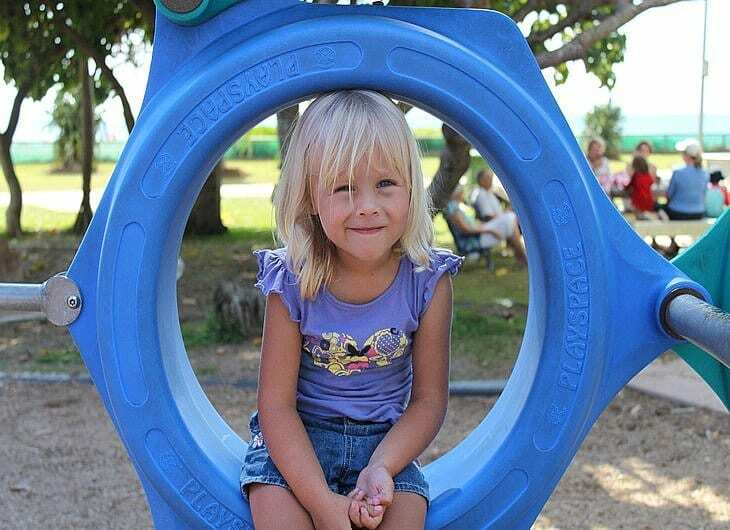 Play with the kids and have a picnic at one of the many beautiful parks along the coast. Laguna Park, Palm Beach is a local’s favourite. Check out the best playgrounds on the Gold Coast and Best BBQ areas on the Gold Coast. Australia’s most advanced racing simulation centre. Race against yourself or race your mates. Any track in the world. Their simulators are the same as professional race drivers use for training and practise – full-motion, surround screen and surround sound technology! Offers three fantastically themed 18 Hole Courses including Jungle Trail, Fun Run and Waterways. Open every day and night. Our kids love going here! Odditorium is a completely new attraction that is interactive and fun. See authentic unbelievable exhibits, incredible illusions, unusual stories, magic, mystery, interactive games and amazing movies. Looking for excitement just inches off the ground? Leman’s is an outdoor 700 metre circuit with over 20 challenging corners. They have Sprint karts, Super Restricted, Super karts and their fastest kart – the Mean Machine. Soak up the sunshine along the 72 km of pristine Gold Coast beaches. 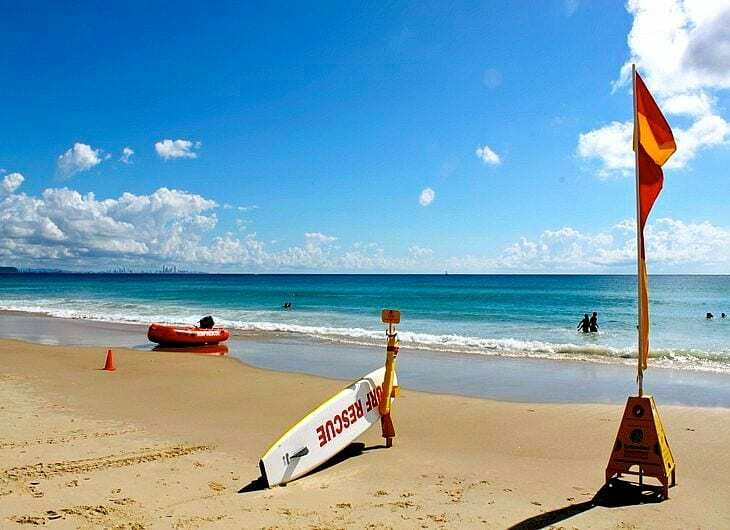 Some of our favourites include Coolangatta, Burleigh Heads, Greenmount, Currumbin, Broadbeach. Gold Coast Sky Dive are the only Tandem Skydive operation on the Gold Coast! Boasting an excellent safety record, state of the art equipment and a pristine beach-side location. Book your skydive here. Held each Wednesday and Friday night along the coastal stretch with more than 100 market stalls and live entertainers. A 36 kilometre network of pathways along beaches from the Gold Coast Seaway (The Spit) to the Point Danger Lighthouse (Coolangatta). Pack your own lunch, plenty of water, your swimmers and camera. Enjoy access to a wide range of coastal environments including spectacular coastal vistas, beaches, headlands, mangroves, and dunes. Read more Gold Coast posts here. Do you have tips for things to do on the Gold Coast? I would do #1, 2, 5, 14, 16, 25 and 26. Of course, I’d also try to get in some hiking and go scuba diving! Yeah Koala’s are pretty soft to touch and cute looking. But I have seen them act aggressive towards each other in the wild. Some great suggestions there! Can I give the David Fleay Wildlife Park a mention? It’s such a nice place to visit, and they don’t have a huge budget to promote themselves. Especially good for families too. Sounds good Philip. Thanks for the tip. With everything you have mentioned it is extremely hard to be bored on the Gold Coast. Currumbin Rock pools are a must for hinterland and family fun, especially when you don’t want to go the beach and get sand everywhere. From first hand experience Draculas is a must, i would not recommend for small children but tweens and teens it is definitely a good scare. This list is perfect for people who have never experienced the Gold Coast and don’t want to get ripped off by tourist prices, great post. Great post on my amazing hometown. Makes me homesick reading it despite not doing most of those activities since I was a kid. Everyone should visit the sunny Gold Coast. It’s a fantastic place. Definitely on our list of possible places to live. City of Gold Coast is one of the best place I’ve visited and I always love to stay forever. Wow these are all awesome! I love the tourist spots specially the Sea world. Gold Coast is such an awesome place to spend you vacation with. I really love your article and the way you present all the nice spots of Gold Coast. Any one who read it will surely be wanting to pack and fly to Gold Coast as soon as possible! I am from Gold Coast but I haven’t yet visited these all (too bad for me) But I won’t let it just pass, after reading your article makes me plan to take a break from work and tour around the lovely Gold Coast. Thanks for sharing! We are headed on a 2 month campervan trip around Australia and I came to your site (been doing so for months now!) for some travel tips on where to go, what to see etc. I am quite disappointed that such a well travelled family and world traveler such as you and Craig would be highlight dolphin shows at seaworld as a good thing to do in Queenstown 🙁 I am sure you have seen Blackfish http://www.blackfishmovie.com/about and are aware how cruel dolphin shows are for these cetaceans. I am a marine scientist by profession as well as a travel blogger so everytime I see travel bloggers pormote the likes of seaworld, I have to speak up and help spread the awareness in case travellers are not aware. You can see more about it here as well https://www.thedodo.com/swim-dolphins-caribbean-1094674999.html I would urge you to take this out, people can see dolphins in the wild and through eco cruises all over Australia and am sure in the gold coast as well? would love to know more information about that! Hi Guys, I will be visiting Gold Coast in the earlier part of May 2017 and most probably be there till mid of May. 1. Any events happening during that period? 2. I’m travelling with my wife and 3 little kids (4yo daughter and a 20mths old twin son), and thought of renting a car when I am there. Is it convenience to drive around or should I opt for public transport instead, or maybe taking an Uber? 3. If I have to choose between Movie World and Sea World, which is the better option? 4. Would definitely like to go shopping for souvenirs, for a bargain hurter like me, where can I go to shop on a weekday? 5. Which is the renown shopping malls along Surfers Paradise? 6. Is it easy to locate a Halal certified Restaurant or Cafe or Supermarket in Gold Coast? Thanks and have a pleasant day. 5. Pacific Fair in Broadbeach (near Surfers) is the best place to go.